We brought Onyx home at the end of September and he has changed our lives for the better. He is a big goof, keeps us active, and has the biggest heart. 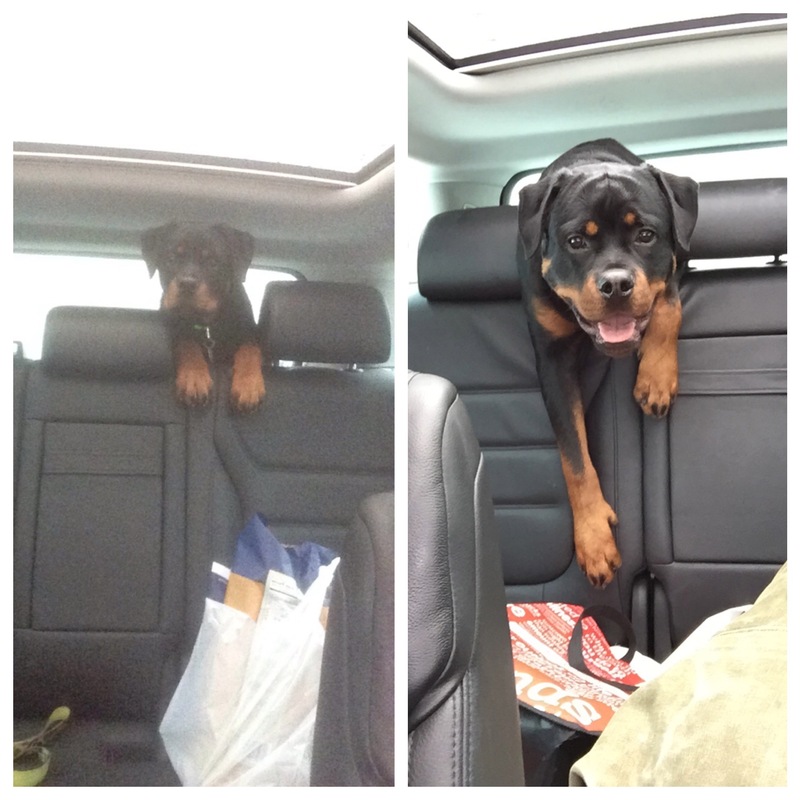 Onyx is a pure, bonafide, European Rottweiler..his dad is from Germany and his mom is from Bosnia. He is already 90 pounds of muscle and we are expecting another 20 – 30 pounds on top of that…although he is so goofy he does not seem to understand how big he truly is ——> when he comes and lays his entire body on me every morning. He has quite the attitude, but can be a good listener…when he wants to be. He either acts like a puppy and does laps around the house, or is completely laid back and hanging out…there is no in between. He goes everywhere possible with his Dad and I…needless to say he is quite spoiled. His birthday cookie and gummy bear toy are from one of our favorite Pet Boutiques, Bone Appetite, and his bow was handmade from the pet store that we have been loyally bringing him to since we got him. We love to support local businesses whenever we can. Scoop the mixture into ziplock bag. Press air out and seal. Push mixture toward one of the bottom ends of the bag, then twist upper portion, much like a frosting bag. Carefully snip one corner of the bag with scissors ***try not to make the hole too big because then the mixture will come out too quickly! I learned the hard way! Use the bag to drop quarter sized dots of the mixture onto your cookie sheet. Once the sheet is full, put it in your freezer for at least 30 minutes or until frozen. In large bowl mis all ingredients one at a time –> make sure to mix well after each addition!!! Happy Birthday Onyx xoxo Cheers to many more! 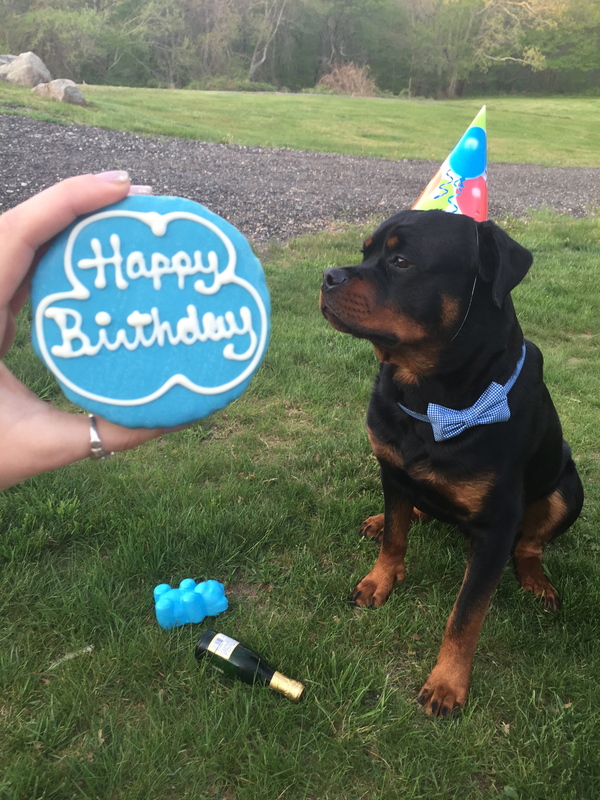 Posted in UncategorizedTagged #Bake, #Birthday, #BoneAppetite, #BowTie, #Celebration, #Champagne, #Chunks, #Cook, #Dog, #Handsome, #Homemade, #Puppy, #PureBred, #Recipes, #Rottweiler, #Rottweilers, #SupportLocal, #Toys, #Treats, 1stBirthday, BellinisToBlooms, OnyxBookmark the permalink.